Converting Torpedo Parker Lights on a Traction to Combination Parker/Indicators by Bruce Stringer | Citroen Classic Owners Club of Australia Inc.
My brother Peter and I have been restoring a beautiful Big 6 belonging to Michael Moore The rear traffic indicators needed to be replaced and I decided to convert the whole trafficator system to LED. I wanted a combination tail, indicator and stop light for the rear and to change the Torpedo parking lights on the front mudguards into combination parkers and indicators. The advantage I had was the Torpedo lights were already wired with a double pole socket. I just needed to find a bulb to do the job and get an LED Flasher Unit. There is already a conversion kit available for the Torpedo light but it is not LED and it was going to cost more than the LED bulbs and Flasher Unit. See photo of Conversion Kit and hover for link. A single contact Torpedo can be converted to a double contact. See photo and hover for link. After much searching on the web I found CREE 1157 Switchback LED bulbs which are found on modern cars and are a combination of parker/indicator. They change colour from white to orange when the indicator is turned on. They come in all shapes and sizes and even as strip lighting. There are quite a few with the correct bayonet size and double contact connection (BAY15D) for the Lucas Torpedo light fitting on the Traction front mudguard. I chose a pair that threw the light forward and ordered them from China. The postage was too expensive out of the US until my brother decided he wanted some and found them on special in the US with free postage to Australia!! He ordered x 4 pair. The size of the LED bulb allowed it to fit just neatly into the available space. 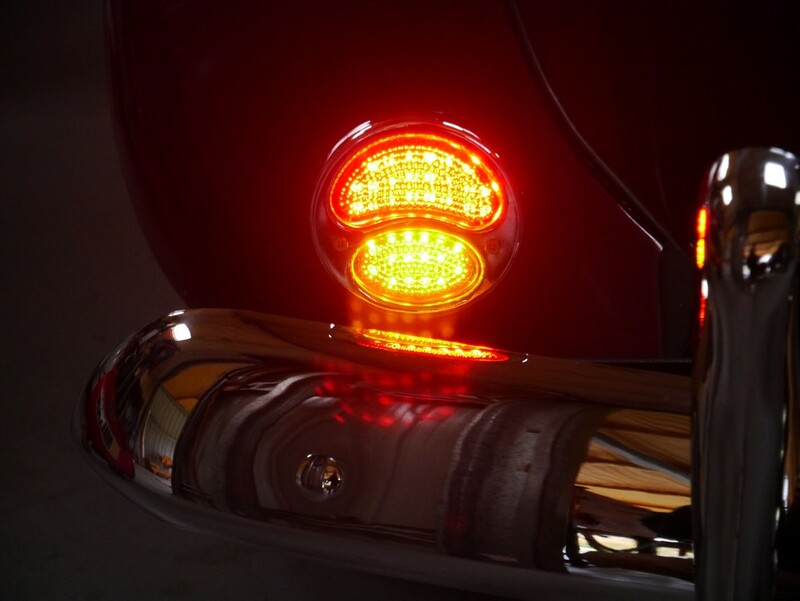 Next I found a pair of retro chrome combination tail/stop/indicator LED lights that I felt quite suited the car and also gave a bright display that couldn’t be missed. Last but not least I needed a LED flasher unit. I settled for a Tridon LED 04 Non Load Sensitive 2 pin 12V unit to connect to the existing wiring. The existing wiring included small indicator lights which were on an additional miniature dashboard attached on the lower right hand side of the main dashboard. Hence, the reason for using a Non Load sensitive LED Flasher unit. I was very pleased that it worked without any hiccups and as an added bonus the flasher box was audible making a loud clicking sound. See photos of the end result. If one is contemplating converting an existing Torpedo light into a parker/indicator combination I would do the maths as it may be cheaper to buy the conversion kit. When changing to LED all lights have to be changed to LED front & back plus the Flasher Unit. That all adds up. My costs were already reduced as the Torpedo lights already had double contacts and the cost of the tail light, flasher, stop combination was irrelevant in this case as they needed replacing.